Coco is very “3” lately. Now, whiny, clingy, shockingly inappropriate, wild, goofy, opinionated (MUST WEAR SOCKS AT ALL TIMES AND IF THEY COME OFF THERE WILL BE HELL TO PAY), sweet, sassy, and sensitive- somehow all appear now within the same 10- minute period. I honestly cannot keep a straight face- she does things Ellery would never dream of. Ellery (almost7) still says that she heard Grant say the “S-word”. At 2, Coco was slinging the word “Stupid” around like nobody’s business. I’m convinced that the third child (a-hem, I’m one too) gets the crazy genes. Anyway, this dress is not for Coco- she’s not really into dresses at the mo. 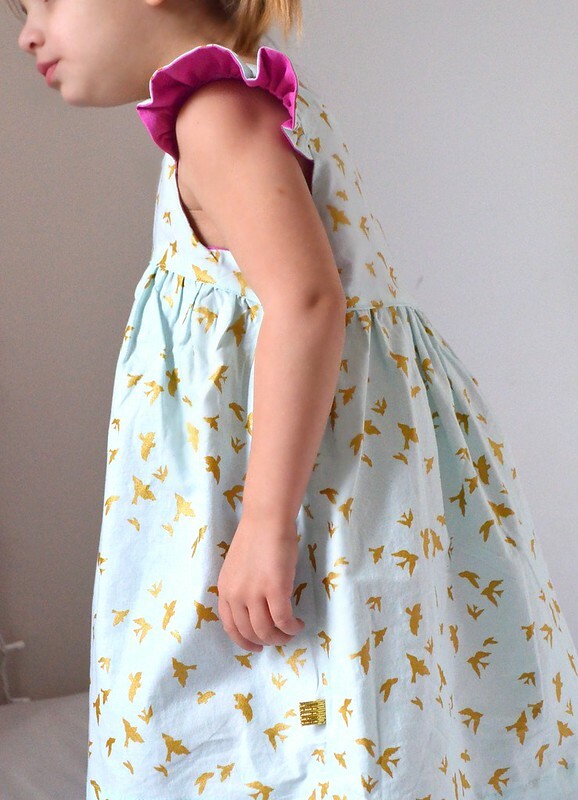 But I had this sweet metallic bird fabric to use up, so I made this dress anyway. I ended up giving it to a good friend’s sister with a little girl Coco’s age. STATS: Bohemian Babydoll, size 3, main fabric is Flight in Mint by Violet Craft, lining fabric is Cotton Couture in Orchid. I love this kid so much. I really see myself in her- I’m sure my mother would agree! Beautiful!!! she looks so cute in the dress. The fabric is to dye for, I bet the new owner is happy!. 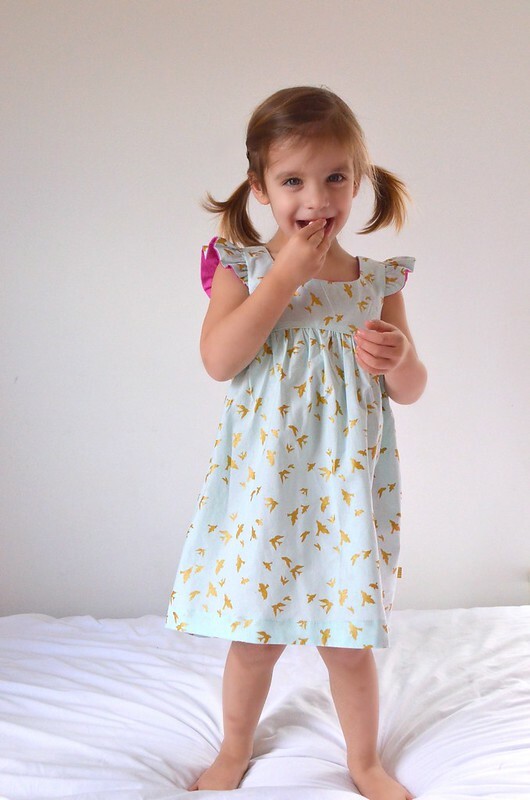 About the no dresses policy, my daughter was all trousers and running away from dresses until her 4th birthday. From then on, she only wants dresses! Thanks Maria- my oldest girl wore ONLY dresses for almost 2 years. It was a struggle to even get her to put on leggings underneath! so funny! I want to hang out with her. Great dress, love the pink lining! thanks! I love a little peek of color! She is so stinkin cute! “STUUUUUUPID!! !” Ha!!! Sounds so much like a 3rd child. They get the crazy genes, and the parents no longer care! 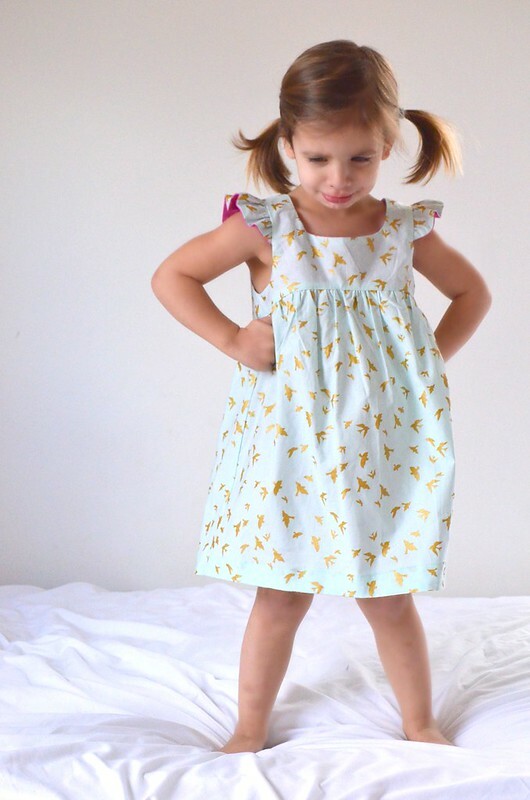 Adorable girl and adorable dress! I can totally relate… my third child also got the crazy gene! Cute dress, love the fabric! ACK! she’s way too cute, i just want to squeeze her. and oh man perfect choices on this dress; that peek of pink is the best. I feel you. My second turns three next month, and she’s been hurdling toward crazy for a while now. Poor babes can’t help themselves. Coco’s questions posed to Siri sound oddly familiar . . .
You’re so talented. Love these pics and I can’t believe she’s already 3!? Hahaha….oh this was great….she and Lily should hang. Sewing question…how do you add your skirt lining? Do you put main and lining fabric together, then baste and gather together, then attach to top of dress?